A couple weeks ago I had the pleasure of collaborating with Miista Shoes, a dope fashion-forward footwear brand based in London. I got to chat with them about my style and music preferences and chose my favorite style from their fall collection. My pick was the BRYCE FOREST boot. I mean c'mon, dark green booties. Enough said. Here's my feature that's up on their blog. My girlfriends and I spent a weekend in Palm Springs to close out the summer. Not going to lie, I am not going to miss the summer, but it was nice to end it on an amazing note in the desert. There is so much beauty here. 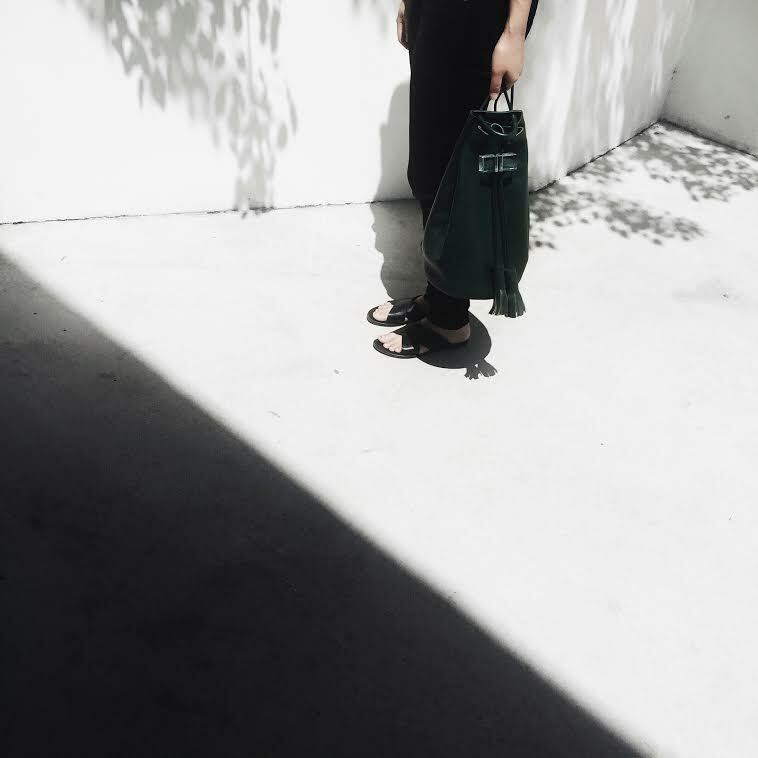 I wore my black Objects Without Meaning jumpsuit (that I bought at their sample sale!! ), Zara slide sandals, Larsson & Jennings watch, + Céline sunnies. Happy weekend! Pretty gloomy and rainy Saturday, but I was feeling girly enough to wear a skirt today. I'm making progress from my tom boy ways. Still, I like to put a boyish spin or touch to all my outfits. What I wore today // Stitch & Needle spring sweater + H&M denim skirt + Building Block box bag + The Horse watch + Nike free sneakers. Doors opened at noon, and it was every woman for herself. Unfortunately, they only had a few quantities for each style, but I was happy I got what I was coveting. // Green Pack + Black Box + White Tassel. So I posted a portrait picture of myself on Instagram today wearing my favorite white tee-shirt. I think everyone, men and women, should own this tee. Confession. I am a tee-shirt hoarder, but I like to think of myself as more of a collector. I am constantly on the hunt for the perfect tee. I mostly wear black pants/jeans and a black jacket, so I'll usually go for white. From T by Alexander Wang and Helmut Lang to Madewell and Uniqlo, I've tried on a lot of tees from all different designers that have all come short to this one. So there you have it. The perfect white tee, because women can wear it too.